Kids at BRICKS 4 KIDZ Grow in Maths and Science Skills! Inspiring STEM based learning and the advancement of education in Queensland through the use of LEGO® and LEGO® Robotics. The importance of maths and science education grows with each passing year. Australia’s Office of the Chief Scientist recently reported that STEM (Science, Technology, Engineering, and Maths) degrees make uni graduates more employable and have more successful careers. Throughout the world, parents and educators recognise that children must start to learn these skills as early in their educational careers as possible. BRICKS 4 KIDZ offers a unique approach to building STEM skills. We use LEGO® and our own in-house lesson plans to teach STEM skills to children across the Sunshine Coast. We offer all kinds of programs – from fun and popular birthday parties with LEGO®, super-AWESOME school holiday workshops with all kinds of themes including Robotics, OOSH & Vacation Care incursions, to shopping centre events – however the most STEM-focused lessons and activities take place in our After School programs. We are convinced that encouraging kids to build with their hands and explore the natural and mechanical world around them inspires their learning about STEM and STEM concepts. The main finding from AEM’s study was that BRICKS 4 KIDZ students of all ages demonstrated growth in targeted maths and science skills. 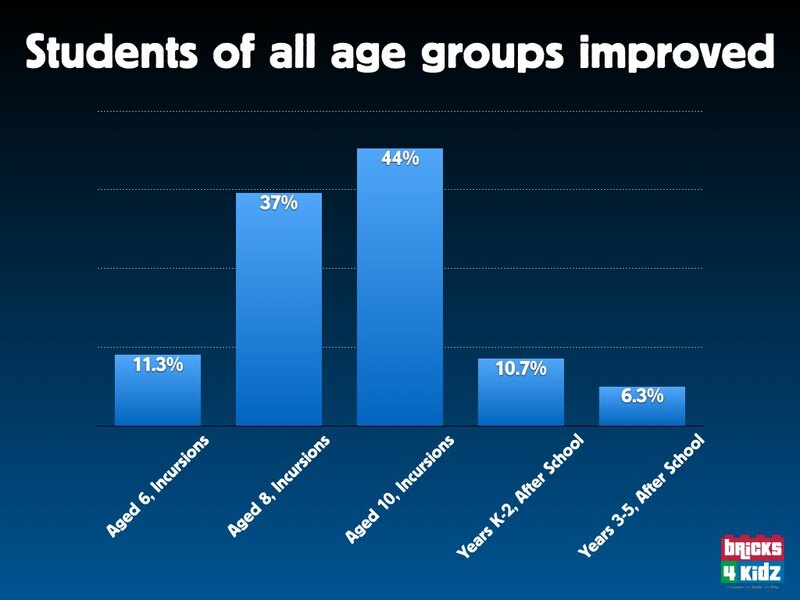 Participation in BRICKS 4 KIDZ School Incursions and After-School programs was associated with increased scores on test items that measured student understanding of key BRICKS 4 KIDZ curriculum points. To measure growth, social scientists often employ a pretest / post-test design. Students take a test at the beginning of a course of study, receive instruction, then take the same test after the instruction has completed. Researchers expect that if students have increased their knowledge on targeted material, they will score better on the post-test. AEM designed a pretest / post-test design for five groups. For BRICKS 4 KIDZ School Incursions, AEM designed a test for kids aged 6, 8, and 10. For BRICKS 4 KIDZ After-School programs, AEM designed a test for students years K-2 and 3-5. If BRICKS 4 KIDZ increased understanding of targeted math and science skills, one would expect to see students score better on the post-test than the pretest. That is exactly what happened in AEM’s study of BRICKS 4 KIDZ. Figure 1 (above) shows that students in all five groups scored better on the post-test, a result consistent with the hypothesis that our programs increase student maths and science ability. Improvement for students in our After-School programs ranged from a 6.7% increase for Years 3-5 to a 10.7% increase for Years K-2. The improvement for students in our School Incursions is even more pronounced. 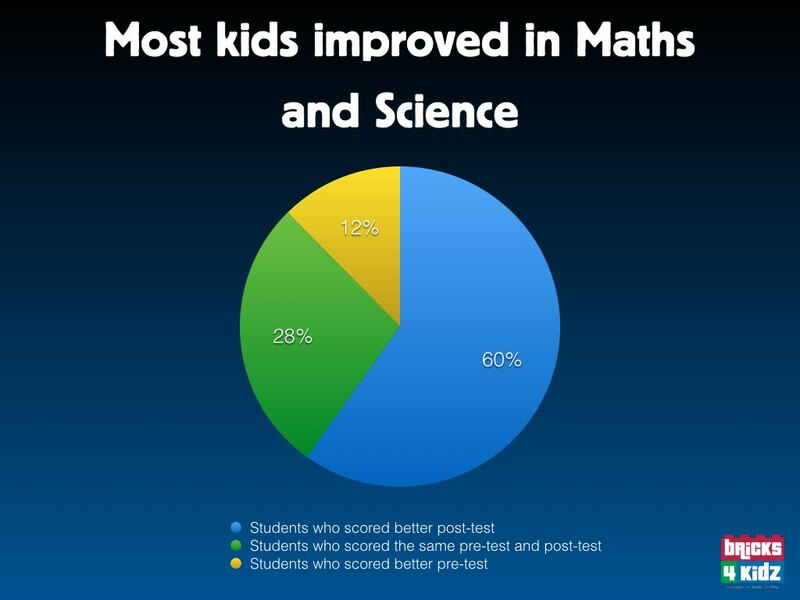 Workshop students aged 6 improved 11.3% on the post-test, those aged 8 improved 37%, and those aged 10 improved 44%. For the entire study, the average child improved 24.4% on the post-test! Figure 2 (above) shows that the average student also improved on the post-test. 59.9% of students scored at least one more item correctly on the post-test over the pretest. In other words, 6 out of 10 children improved their maths and science skills over the course of their BRICKS 4 KIDZ participation. Spots at our BRICKS 4 KIDZ After School programs at Nambour Christian College, Brightwater State School, Currimundi Primary School, Montville State School, Caloundra City Private School, Caloundra State School, Buderim Mountain State School, Chancellor State College and St John’s College are currently open, and going quick. If you’d like to talk with us about bringing BRICKS 4 KIDZ to your school, give us a shout! The results from AEM’s study show that participation in BRICKS 4 KIDZ programs was associated with improvement in maths and science skills. Students demonstrated greater understanding of age-appropriate curriculum at the end of their BRICKS 4 KIDZ participation. Advanced Education Measurement uses cutting-edge data science and statistical analysis to help educators, policymakers, and their partners improve student outcomes. AEM Founder Dr. Bryan Shelly is a Princeton-educated Ph.D. who uses his 15 years of education research experience to design peerless systems of program evaluation, on-track and early warning indicators, student and community engagement, and more. Please learn more about AEM here.